See NOTES on the previous post. In this splendid example of colours on frescoes at the Palace of Knossos, “The Griffin Fresco in the Queen’s Megaron”, I have given the names of the most common colours used on Minoan/Mycenaean frescos. 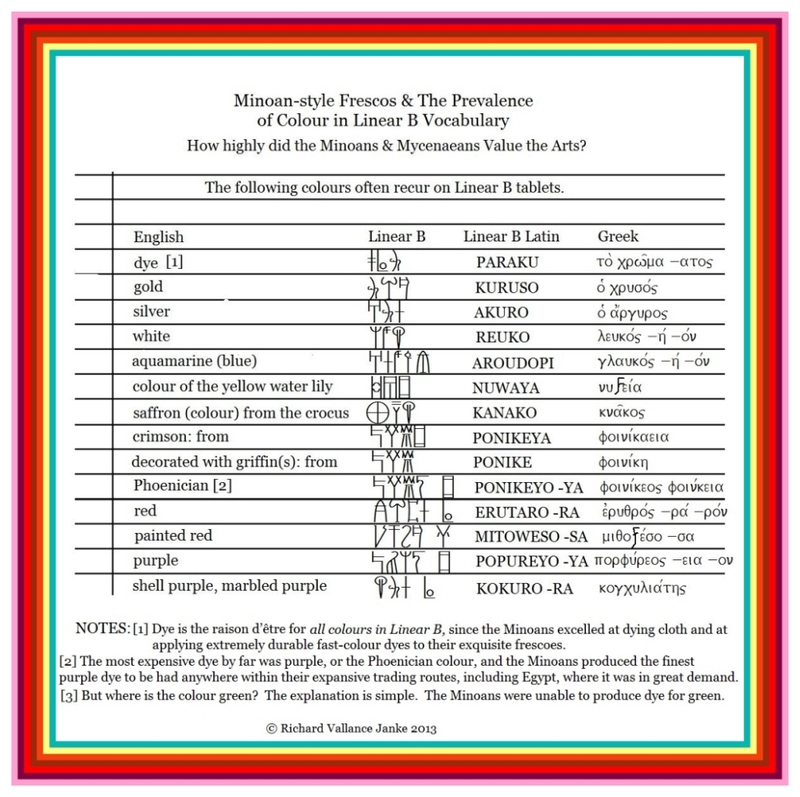 The Linear B characters and their Latin equivalents are shown for the first 6 colours in this illustration. 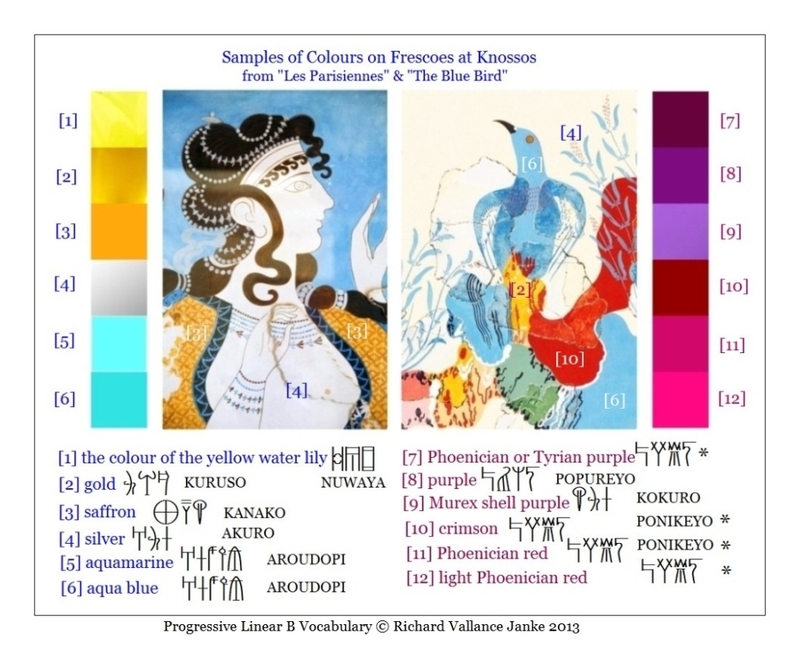 In the next post, you will be able to view portions of the famous fresco, the so-called “Les Parisiennes” and the equally lavish “Blue Bird or Caravanseri'” fresco, with the Latin equivalents of the Linear B characters shown for the next 6 colours  – . Despite the paucity of Linear B vocabulary on extant Mycenaean/Minoan tablets (estimated as some 2,000 words more or less), colours play a predominant rôle. 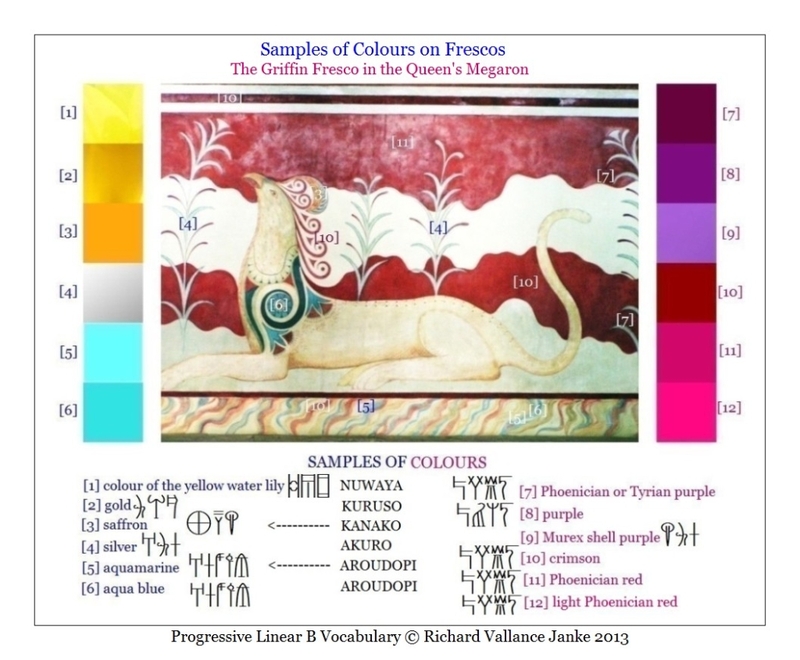 What is so striking about the Linear B vocabulary for colours is its precision and richness. Linear B not only has the standard words for several colours, white, red, purple and black, it even has words for (often highly) unusual variants of the some colours, such as the colour of the yellow water lily (instead of just plain “yellow”); aquamarine (instead of plain “blue”); saffron (from the crocus); crimson, which is directly derived from the Linear B word for “Phoenician”, meaning of course that the colour we know as “crimson” is in actuality, “the Phoenican colour”; “painted/dyed red”, in addition to just plain old red; and “shell purple” as well as “purple”. Shell purple is a gorgeous marbled purple from sea shells. So to summarize, the Minoans were extremely conscious of the power and magnificence of colours, and they sure knew how to “put on the Ritz” in their generous application of them. One look at any single surviving Minoan/Mycenaean fresco speaks volumes to the exquisite taste the Minoans and Mycenaeans had for colour in art, as attested by their absolutely stunning frescoes! Few, if any, civilizations, ancient or modern, have ever attained the heights of brilliant artistry in frescoes as did the Minoans. I for one consider Minoan/Mycenaean frescoes to be far superior to the rather stiff frescoes and iconic art of the early Christian and Medieval churches. But of course I am biased. Now, one seemingly perplexing question remains. Where is the colour green? The answer is much simpler than you might imagine. In spite of all their talent for producing a dizzying array of lustrous colours on their frescoes, the Minoans – or for that matter – none of the ancients in the Western world at that time – were unable to produce green, which is why all the trees in their frescoes are blue. But we can forgive them for this omission, considering the spectacular and enduring beauty of their frescoes. In the next post, I will display for your delight and artistic appreciation 2 of the most magnificent frescoes from Knossos, illustrating the highly imaginative application of colours the Minoan artisans lavished on their frescoes. I will tag these frescoes with the colours applied with their Linear B, Greek and English names.